In this lavishly produced MGM production, the ethereal Lillian Gish is a bit more earthy than normal, due in part to the selection of her co-star, he-man Norman Kerry. "Suggested by" the well-known song, the story involves two feuding Scottish clans, the MacDonalds and the Camerons. Annie Laurie (Gish) tries to bring the two clans together peacefully at her home, Maxwelton, but winds up being the cause for even more enmity because both Ian MacDonald (Kerry) and Donald Cameron (Creighton Hale) love her. She throws her lot in with Ian when the vengeful Donald uses underhanded means to get rid of his foes. Annie battles the Camerons and climbs a mountain to light a warning beacon. After her ordeal, Ian carries her to a barge and they sail over the loch. The last part of the film was shot in two-strip Technicolor. 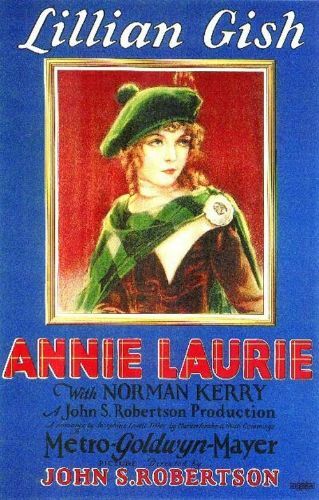 Annie Laurie wound up losing 264,000 dollars, which certainly did not help the ever-worsening relationship between Gish and the studio.